According to a new survey, 94% of endowment funds have been allocating into crypto throughout the course of 2018. The study, undertaken by Global Custodian and The Trade Crypto in a partnership with BitGo, surveyed a total of 150 endowments. The survey revealed that 54% of respondents directly invested in cryptocurrency, while 46% invested via crypto-based funds. A further 50% of respondents stated that they were looking to increase their stake over the next 12 months, with 45% relaying that they would remain holding their current allocation. Amazingly, it appears that the 2018 downturn didn’t put off these new investors with only 7% responding that they expected a further decrease over the next year. What makes a perfect crypto investment? According to the survey’s respondent’s compliance with regulation, sufficient capital and liquidity alongside appropriate security are a must-have. As reported, Wences Casares CEO of Xapo, a leading Bitcoin (BTC) wallet, recently came out to claim that it isn’t just prudent to hold a stake in BTC, but rather that it would be “irresponsible” for major portfolios not to have exposure to it. Another believer in holding even a small amount of BTC, is Anthony Pompliano, co-founder of Morgan Creek, a crypto hedge fund. 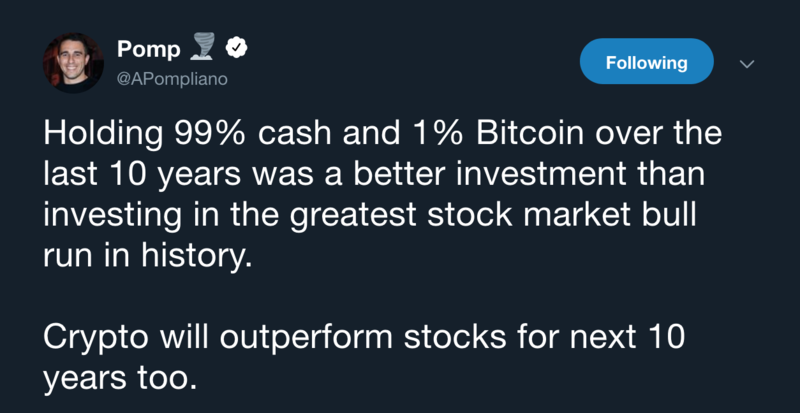 Pompliano stated back in February that holding 99% cash and a 1% BTC portfolio would be a better investment than stocks within the next 10 years. This was after a Tweet by a notable analyst known as PlanB who revealed that this portfolio arrangement had beaten the S&P 500 over the last 10 years.